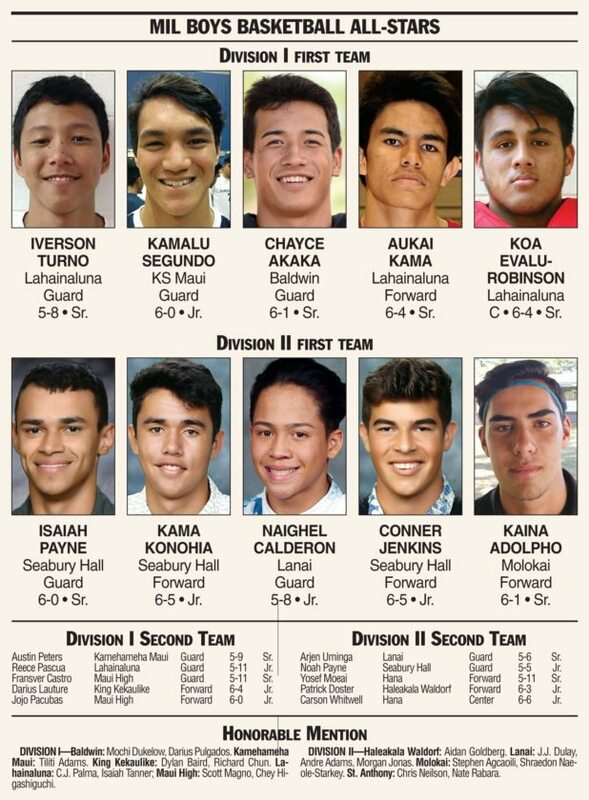 Lahainaluna High School’s Iverson Turno and Seabury Hall’s Isaiah Payne are senior point guards from the Maui Interscholastic League’s two dominant programs. 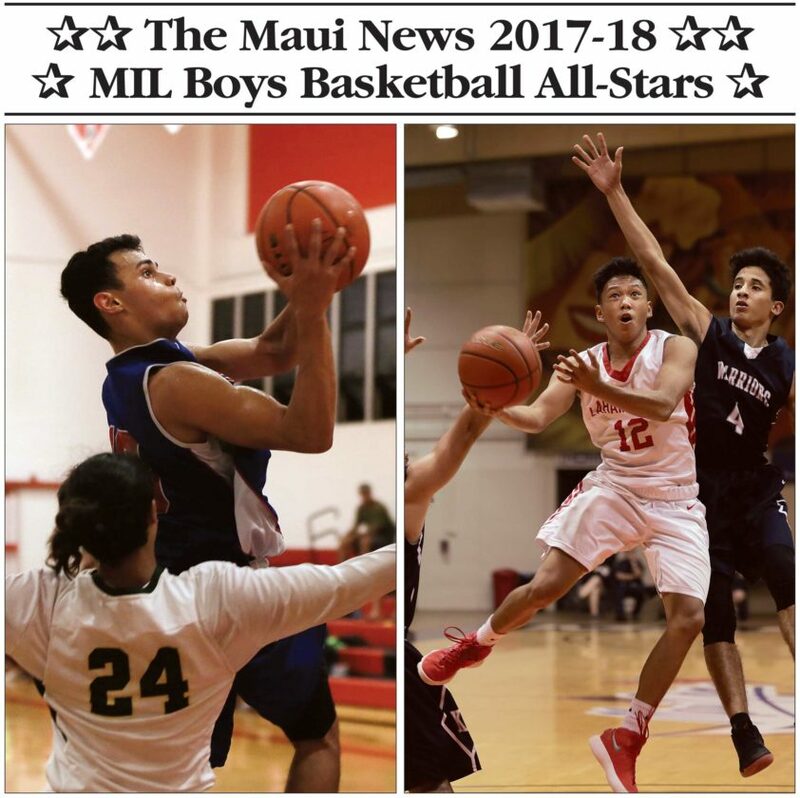 They are also the choices of the league’s coaches as The Maui News 2017-18 MIL Players of the Year in boys basketball. Turno won the Division I award for the first time, while Payne claimed his third straight D-II nod. Turno grew up with head coach Jason Justus in the Lahainaluna program — they share four years of emotional ups and downs, and four league titles. Turno is joined on the D-I first team by teammates Koa Evalu-Robinson and Aukai Kama, Kamehameha Maui’s Kamalu Segundo and Baldwin’s Chayce Akaka. “As a point guard for this team, I’m the second option, so I had to look to pass to my teammates to make the team better,” Turno said. Payne started as a sophomore at point guard for a Seabury Hall team that advanced to the D-II state final before losing to University Lab School two years ago. The Spartans lost in the semifinals last year and fell in the quarterfinals this season after winning their ninth straight MIL crown. Payne is joined on the D-II first team by teammates Kama Konohia and Conner Jenkins, along with Lanai’s Naighel Calderon and Molokai’s Kaina Adolpho. Payne says he is deciding among about five colleges for either basketball or track, where he is a sprinter. Seabury Hall coach Scott Prather, the choice of his peers as MIL D-II Coach of the Year, was a standout point guard at Maui High and the University of Hawaii-Hilo. It took some time for Turno to develop the right attitude — he couldn’t recall the number of times he was told by coaches to leave practices in his first two seasons under Justus, a former NCAA Division I player himself. In his junior season, Turno kept the number of practice dismissals to three, and in his senior season it happened just once. Justus, voted MIL D-I coach of the year, but he deflected credit to assistants Kalei Houpo and Rachael Kane. He will always have a special place in his heart for Turno, who is considering joining last season’s MIL D-I Player of the Year Jeremi Santos at Cypress Junior College in California to continue his basketball career. The Lunas finished third and fifth in the last two state tournaments, going a combined 4-2 in Honolulu. Their chance at a state title this year dissolved in a 50-40 quarterfinal loss to eventual state champion Punahou. Turno will never forget his Lahainaluna basketball days.